Recent discoveries of direct acting antivirals have revolutionized the treatment against Hepatitis C virus (HCV) infection. Yet rapid evolution and high diversity of HCV populations, combined with the reality of suboptimal treatment adherence, make drug resistance a clinical and public health concern. With Alan Perelson and Ruy Ribeiro at LANL, I have analyzed a unique dataset collected from a clinical trial of a next-generation protease inhibitor, MK-5172. Constructing evolutionary models to describe both the viral load and the sequence data at the same time (termed as phylodynamic analysis), I showed the importance of target cell availability in explaining the rapid resistance selection of HCV, and the potential of curing infected cells as a result of the action of the protease inhibitor. These results shed light on how resistance can be rapidly selected and the actions of the drug, which are important for optimizing future DAA combination therapy for HCV. 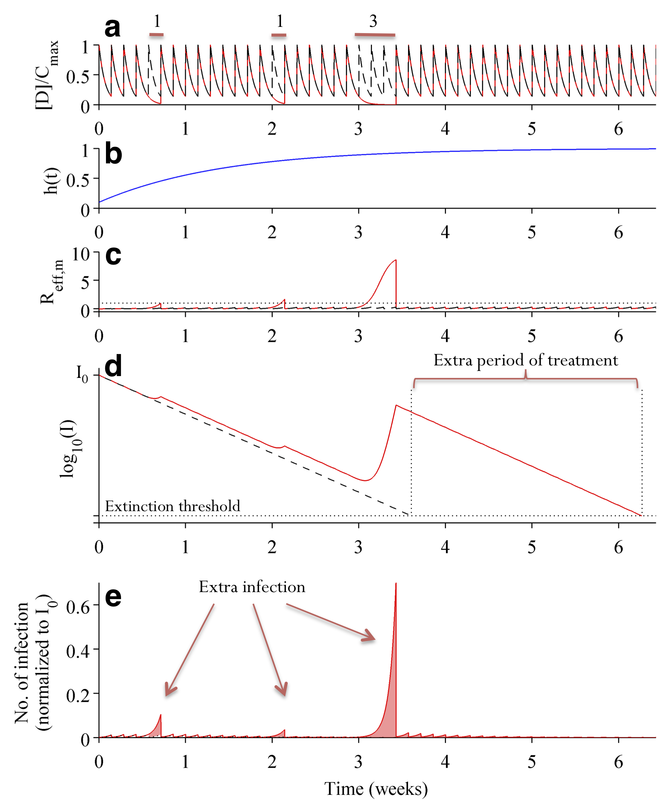 With Jamie Lloyd-Smith at UCLA, I have developed a general model incorporating viral dynamics and pharmacokinetics/pharmacodynamics to assess how suboptimal adherence affects resistance development and clinical outcomes. We have derived design principles and adaptive treatment strategies, identifying a high-risk period when missing doses is particularly risky for de novo resistance, and quantifying the number of additional doses needed to compensate when doses are missed. This theory developed in the work would serve a useful tool for clinicians to design and manage treatments of combination therapies of direct acting antivirals. Simulation runs showing the impact of suboptimal adherence: 1) persistence of pre-existing mutant, and 2) risk of de novo generation of full resistant mutants.